In thinking about how best to conclude the “food” themed week for Map O’ The Day, I landed on a map that has a subject matter near and dear to my heart. Specifically, Czech beer. This shows a comprehensive view of all the excellent breweries in the land of beer. 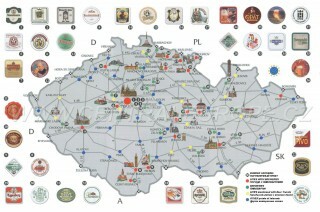 I believe this map was created by the Czech government as a travel guide. While the design of this map isn’t spectacular, keep in mind that today is the 75th anniversary of the repeal of prohibition, so go out and have a beer to celebrate. You can even fly to the Czech Republic and find yourself a brewery if you’re so inclined!! Another map from the International Networks Archive via Princeton U that presents some interesting views on the world’s water supply as well as current and future usage. Pretty amazing to think that even in the modern world that 7 people die every minute globally from a lack of clean water. This map utilizes one of the Maga mapping principles, namely, using a system, or multiple views of information to understand the landscape. 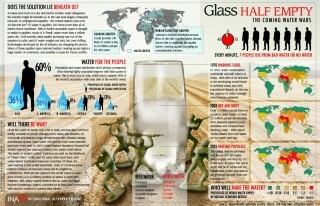 See the far right side to understand this chronological system which is depicting the evolution of the clean water issue. Gotta love anything with toy soldiers in the design, and a strong use of color and image [silhouette] to provide bold emphasis on the usage by continent figures. So while cigarettes aren’t really food (theme for this week), I suppose to some they pass for a meal! This is another map from International Networks Archive (Princeton U), and like yesterday’s McBucked map, I think this map is wildly successful in it’s presentation. 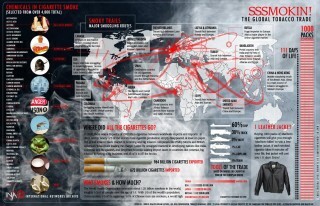 The global tobacco smuggling trade, and it’s accompanying logistics are front and center, but if you examine the map, that information set is not the true purpose of this image. In a very “Tuftesque” (think Napoleon Invasion Map), they’ve created a very powerful anti-smoking message by framing the world tobacco trade map with compelling reasons to not smoke cigarettes. We should all be striving to exude this type of authority over our own subject matters! 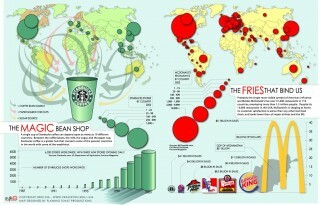 So, in sticking with the food theme this week, (like we need anymore reminders to gorge ourselves around the holidays), I’ve attached this excellent map / info graphic regarding Starbucks and McDonalds, which I found on the Princeton website. Pay particular attention to the fact that McDonalds, while being currently ranked worse in customer satisfaction, is still bringing in gross sales larger than the GDP of Afghanistan! There’s a strong use of shape in this graphic that instantly allows a viewer to understand proportion for both Starbucks supply and McDonalds restaurant distribution. Not an overwhelming amount of information, which is a positive in this case because it allows a strong representational presentation of key storytelling elements for both the Burger and Latte giants! Enjoy. The data here is from 2004, and covers 70,000 square miles. This is from a Carnegie Mellon student, Alexander Cheek, who majors in Information Design. Pretty interesting conclusions to be drawn from this view.